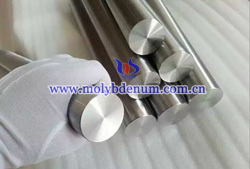 Powder pressing or wedge shaped forming is one of molybdenum forming methods and it refers to the powder body or powder compact under pressure through specified mouth to form billet or product. In accordance with the different pressing conditions can be divided into cold extrusion and hot extrusion. Powder cold extrusion method is to make molybdenum powder mixed with a certain amount of organic binder at a lower temperature (40 ~ 200 ℃) extruded into billet. This method can extrude billet with thin wall thickness and small diameter mini-pipe, and it also can produce complex shape, good mechanical properties and high density products. Powder hot extrusion method refers to the powder metal or powder compact packed into the package heated to a higher temperature for extrusion. This method includes pressing, sintering and thermal processing, which can directly obtain complex shape, better physical and mechanical properties products and can accurately control the composition of products and alloy internal organization.